On MyShingle, we celebrate the solo and small firm practitioner, and those at the forefront of innovation in the legal field. Our newest project, 41 Legal Practice Areas That Didn’t Exist 15 Years Ago highlights solo and small firm practitioners who have embraced unconventional and upcoming niche practices from Climate Change Legislation to “Gig” Economy Law. Our next profile is of Robert C. Lehrman, who specializes in Craft Alcohol Law. Craft Alcohol Law encompasses beer, spirits, cider and wine that are made by homebrewers or independent breweries with particular emphasis on natural production. Alcohol in the United States is a heavily regulated industry, so a wide-variety of legal issues are applicable to this domain, varying from tax law to environmental law. The trend of “buying local” has helped craft alcohol businesses thrive, particularly in a time where social media can cultivate a loyal following, and generate new interest in niche products. In particular, Lehrman discusses his involvement in creating precedence via his involvement in legalizing Absinthe in the United States. A: My name is Robert C. Lehrman. I have worked at Lehrman Beverage Law, PLLC since 2001. Our website is www.bevlaw.com and our blog is at www.bevlaw.com/bevlog. Q: At what point in your career did you begin to focus on Craft Alcohol Law, and what was the motivation for choosing Craft Alcohol Law? A: I would like to say day one, because all my work after law school has been in the alcohol beverage field. But the craft segment did not really exist until about 15 years ago, so I have only worked on craft beverage issues as such since a little after my firm started. Before that, the industry was more oriented toward big producers like Miller and Heineken for beer, Gallo for wine, and Brown-Forman for spirits. I had no real motivation to target this sector. It came to me, rather than me aiming toward it. What I mean by that is, my first good job offer was in the pre-craft, alcohol beverage sector. So I worked on that from 1988 until craft emerged. Then the push of work shifted toward craft, without too many choices to be made about it. Q: Tell us a little about your work in Craft Alcohol Law. What types of clients do you represent and what are some of the legal issues you encounter? A: Alcohol is heavily regulated, and a lot of the rules are nearing 100 years old. I will not be surprised if pot ends up being less regulated, or quite differently regulated, because the alcohol model seems outmoded in some ways. It is very resource-intensive and cumbersome. For example, every label has to get an affirmative, pre-market approval. No big deal if it’s a few hundred labels per year, or the rules are cut and dried. No and no. There are many hundreds of labels per day. And they raise serpentine, highly subjective issues. What is misleading? Is it misleading to say “handmade” on Tito’s or on Bud? Who should regulate this? Consumers? Courts? Plaintiff lawyers? Me? Bureaucrats? There are lots of tax issues too, because booze taxes bring in billions. The rules are getting increasingly complicated, as the small guys lobby for tax breaks, and it gets hard to define, even, who is small and who is pretending to be small. Q: What do you enjoy most about Craft Alcohol Law? A: The people are great. The issues are great, too. It is a nice combination of business, foodie, marketing, law. Many days, the issues seem rote, but then almost weekly, something pops up that is surprising, and reminds everyone that the rules can bite you hard if you get complacent. Q: What kind of background is necessary for Craft Alcohol Law? A: People tend to think this field is pretty narrow. It could easily be argued the other way. After all, it would not be weird to have a much more narrow lawyer, who does for example California beer law, only. That could be enough work for any one person or small firm. We are handling beer, wine and spirits, imports and domestics, large and small – and sometimes that feels too broad. There is state law, treaty law, environmental law; this field may well border on the majority of other fields of law. Maybe not power law, but litigation, lobbying, tax law, corporate law, securities law, on and on. So, I would not say any particular background, other than being a good lawyer, is important. A science or math background might be nice, but I hesitate to say any such thing other than the mainstays of legal research and writing are key. Q: How did you market your practice and gain a reputation in Craft Alcohol Law? A: A smattering of blogging, going to conferences, speaking, and such. Perhaps most important is just the long slog of working in the same field for many decades and trying to do a good job on each matter – whether the client is big or small. It is also amazing how often people come into the field with a bang, and only stay a few years. People come and go. That could be a function of working at a big firm or company, where people don’t have the autonomy to stay with something as long as they might like. One benefit of small firm practice is that I can stay with a given sector as long as I want, and those external forces won’t throw me out. A: I am trying to think of an issue for which there is no precedent. At the risk of being argumentative, I would take the side of, you can find a precedent. There is nothing so unique about making a certain craft beer, compared to making other things, such as other than beverages, or other than in a craft way. A lot of the issues swirl around and arise cyclically. As an example, the government gets very slow on processing paperwork, every couple of years. That is, instead of two days to review a formula, it can go to 30 days. From three to 30 days on a label. Conversely, it can go from 120 days to five days on a permit. 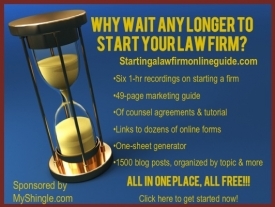 All this makes a huge amount of work for lawyers because time-to-market is a huge issue for many companies. Practically speaking, this means: knowing who to call, knowing the regulators, and what they want and need; what factors help or hurt; getting the application in a shape where it’s likely to be approved, when it gets in front of the regulator. But, in my quest to find an issue without much precedent, this “handmade” issue as above, is a good one. There is little precedent, because until fairly recently, it was not a compliment. Producers wanted to be modern and reliable, more than finicky or handmade. There is not a lot of case law on this. I even dug around many other countries, such as Italy and Canada, and so on, looking for judges that took a stand, and tried to draw a line between what is handmade and what is not. I did not find much other than something circular, such as tending to be made in a less automated way. Tito and his vodka are huge beneficiaries of this absence of precedent (or at least any precedents setting out a hard and fast definition of this term so prominently used in pushing Tito’s Vodka toward ubiquity). A: I worked on the legalization of absinthe, from 2004 to about 2008. So far as I know, I worked on this more than any other lawyer. Absinthe was banned, pretty much worldwide, for about 100 years before that. It was wildly popular in France and other countries before this ban, and that’s among the reasons it got banned. It was encroaching on wine and milk sales. Yes, there were lots of bums in the street, obliterated with absinthe – but this could be a function of its popularity, alcohol in general, or low quality alcohol. Anyway, a small producer and importer contacted me in the early 2000s. I put in a few hours and said it would be hard, and the government said no. We pushed and got formula approval in 2004. The government said it’s fine to sell it and drink it – but not fine to call it by its real name. This was a revelation about how the adults don’t always know what they are doing. It took another three years to get permission to use the dreaded “A word” on a label. Absinthe should be case study one about junk science and arbitrary government. Also, how illegality often just makes people seek things out more. The whole story is here. Q: What advice do you have for other attorneys interested in Craft Alcohol Law? A: Go into pot law. It’s pretty similar, and probably raises similar issues, and will leave more beer, wine, and spirits for me to work on.